Home » What is SAP Certification? And Why Should You Care? What is SAP Certification? And Why Should You Care? Author Written by Cleo Isco and last updated on Posted on September 20, 2017 . Posted in Categories SAP Certification FAQ. Before we go any further, first thing that needs to be said: Only actual SAP experience is a valid qualification for SAP jobs. You can look at it in terms of graphic artists. People are more impressed by beautiful portfolio than by art degree. Okay, so what is SAP certification and why should you care? SAP Certification is an exam conducted by SAP AG, the leading provider of ERP (Enterprise Resource Planning) software and it is expensive by anybody’s standards, which usually means that your employer should be one paying for your certification. When that is not possible, it’s time to jolt down those good old pro’s and con’s and decide whether it is right investment to make. Just like most other IT skills, SAP certification is full of controversy because of the contrast between the importance of certification versus hands-on SAP skills. If you intend to have a career as SAP consultant the choice is easy. In that case you are required to obtain the certificate from SAP. That makes sense as SAP consultant is expected to stay updated in order to be able to lend expertise to companies and help them build hi-tech services. If you are hoping to get certified in order to get a job, unless the place training you guarantees job placements, you might as well forget about it. This is very in demand field, and there is always going to be more qualified personnel than jobs. Primary candidates for SAP certification are people who already work with SAP, but are looking to gain more credibility and open up opportunities for advancement. Yes you might already know everything about SAP better than SAP AG, but if you are up against somebody who has experience and certification, they are more likely to get that job. SAP is one of IT skills that is likely to always be in very high demand, even during periods when economy is doing rather poorly. It is not investment into present, but into the future. Have we answered the question “What is SAP certification?“? Please let us know in the comments below! You may also be interested in the following articles: What is SAP? Exactly! This is the situation that many newcomers to the SAP world are facing. I believe that people should first try to get some SAP related experience and only then continue with the certification. How did you do that? I mean passing without any experience? Hi Cleo, I am a mechanical engineering student (final year) . I want to get certified in material management. Please tell me what is the scope in SAP for mechanical engineer in future. 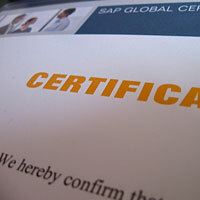 In US the situation with SAP certification is much better than in Asia. You do not have to enroll into SAP training course and spend a fortune on it (like fhatuwani did). If you a confident in your knowledge, you can just go and write the certification. I think it is around 500 USD. I really hope that you will get the right opportunity very soon! Thankyou so much for quick response….. Yes the certification cost is 500 USD…..
Just planning to give it soon if any guidence as to how to prepare plz let me know…. I would like to give the latest version SAP Certified Application Associate – Business Intelligence with SAP BW 7.3 and SAP BI 4.0 C_TBI30_73…I do not have standard SAP Notes so plz Advice me the right path and let me know in How many days I should prepare and appear for the certification….I have started studying with TBW10 & 20 …Also let me kknow if any good SAP-Press Books to refer..
We have a special section for SAP BI certification, please see the link in the footer of this page. You are reading the right books. The certification mainly tests the knowledge of the content of these books. Other good books from SAP Press are listed in the ‘Books’ section of our website (please see the menu above this post). Just read their description and pick the one you like more. Good luck with your SAP certification! Let us know how it worked out! Well said, here in India we have to invest a good amount of money on training only, where the classes are only just bunch of a slide show nothing more than that & afterwards only one can qualify the criteria for getting the certification. Really hopeless for most of the asian country. I now hold 2 certificates, one in FI and other in SAP Business One. Am based in RSA…… What are chances or should be my next step? I am really sorry to hear that… However, I thought that in South Africa there is good job market for SAP professionals because some of my ex-colleagues (SAP consultants) even moved to South Africa after getting job offers with very good benefits packages. You should not give up! Try as many interviews as possible, eventually you will get it, I am sure! I am a BSc IT Graduate and very much interested in getting a job a SAP professional. I am not working as a Software developer but a non technical Profile with a Healthcare IT company. I would like to know the jobs in SAP that I can try to get to earn some experience and later on do a SAP Certification. Please Guide me.If Possible step by step details. I did not really understand what is your current job. Are you a software developer? Then, it is a good idea to become SAP ABAP consultant. Essentially, you will be writing code for modification of standard SAP functionality and adding new custom features. Then, you will be able to go for SAP ABAP certification. Hi,I am looking for SAP BI certification & I am already working in SAP reporting tool i.e. Deski & Webi (but only involved in report designing part) from last 3-3.5 years.So can I go for SAP BI Certification & could you please also guide me that SAP BI certification includes Universe designing? ?I am very keen to do the universe designing. If it so then how can I learn the universe designing in 4-5 days as SAP academy is offering a course of 13 days for SAP BI certification which includes 4-5 days for universe designing. Kindly suggest. We have a dedicated page for SAP BI certification. However, I think, that you actually need SAP BO certification because the Universe Designer is a part of SAP Business Objects curriculum. Unfortunately, we do not (yet!) provide information about SAP certification in BO but it is certainly in our future plans. You can learn more about the Universe Designer in the following courses: BOU310 (3 days) and BOU320 (2 days). Thanks a lot for providing this info!! Really appreciate for this!! But Cleo how can I learn the universe designing in 5 days, I mean SAP Academy covers everything about Universe designing in 5 days i.e. How to create objects, Creating complex linking in any database Or they will just provide the overview about Universe?? According to the description on SAP Education website, the first course I mentioned teaches basics of the Universe Designer. The second one is the advanced course. So, I think that in 5 days they cover everything. Disclaimer: I have never taken those courses myself so my advice is based on the publicly available information shared by SAP. I have SAP BI Certificate, and currently doing SAP BW/BI/BO. Currently I been given a chance to sit for SAP FI exam (I only need to pay for Exam fees which is around SGD600). 1. Would SAP FI Cert would help me gain any advantages prior to what I do? 2. Or perhaps allow me to change FI capability in the future etc? I don’t think that you need SAP FI certification. Big data and business analytics is a hot area now and, I think, it will continue to grow. I recently read about a study that indicated a shortage of data scientists and professionals who can work with the big data. My proposal is that you should focus on BI/BW/BO. It will be beneficial for you in terms of a faster career growth and a higher salary. If you for some reason still want to switch to FI, then SAP FI certification will likely benefit you. But again, I don’t think you should go for SAP FI. I would say that you should start reading about SAP PP on the Internet and try to get some basic knowledge about SAP yourself. Then, if you like it, take an SAP training course for a deeper inside into SAP PP. After that, try to apply for entry-level SAP jobs. You can also pass SAP certification after the training course or when already have a job. 1. it is advisable to change the career ? 2. What is the job scope as SAP PP for the person like me. I don’t know anything about you 🙂 So, it is difficult to answer your questions. The only thing I can say for sure is that you should wait with SAP certification. I don’t know the job market for Sybase ASE & IQ. If there are very few vacancies available, then moving to SAP HANA may be a good idea. SAP certification in this case may help you to make the career switch because it would be viewed as a positive asset by recruiters. Read your previous comments and liked it too. Need little advice from you. I am a graduate and working in HR field as recruiter from past 5 Yrs. I wish to have career shift now and i am thinking to do SAP HR certification.I am in India now and wish to work abroad.And i have little knowledge on SAP but no working experience. 1)Will SAP HR will give boost in my career. 2)As per my knowledge SAP HR is not very popular module, many companies dont look for SAP HR people. Is it true. 3)Will i able to get some SAP HR jobs abroad based on my exp+certification. I am a B.tech and working for 2.2 yrs in an IT company in India. Currently I am working on Sales Reporting using the Client’s reporting tool which requires very basic knowledge of SD and ABAP. I am not very happy with my current project as its not giving me any good experience which can help me in my career. I am thinking of taking training in SD and hence switch to some other company. Could you please give your advice on this? Hope you doing well in your current job..
First Clear you i’m not Passed out or any experience in IT related sectors..
you really wanna change in your life then SD or ABAP good options for you…. Definitely a great portal & articles..thanks. Currently I’m working as a Team Lead in .NET programming language in a software company, no doubt this position contains technical & functional both roles and playing the same. But now I’m willing to switch from core development to techno functional role or domain in term of SAP to join a non IT organisation. Basically I’m interesting to join steel plant or similar type of manufacturing non IT companies, so decided to pursue SAP modules. But it’s bit confusing to choose the appropriate functional modules since it seems look there are lots of modules exist. I need some suggestion so that I can choose the appropriate module & that future should be secure too. Please advise me how to choose the correct module as well the process through which I can be familiar the same please. Already I have decided to opt SAP Basis or SAP BI but looking forward to your positive response. I think that, taking into account your solid programming background, you should try becoming SAP ABAP consultant. There is always a big demand for ABAPers (this is how ABAP consultants are informally called) on SAP projects. It should be relatively easy for you to learn ABAP because people who already know one programming language can more easily learn another one. SAP Basis also can be an option. Yes I agree with your suggestion that it would be bit easier to catch a new language if already working in other programming language. That’s why I kept this is one option too. But I’m willing to move form code programming to techno functional role specially where I can interact with data as well as all module’s data and top most can join a non IT organisation such as manufacturing or production company. I considered if I’m going to work for any non IT organisation then need to manage the functionality as well as related stuffs so SAP BI would be bit appropriate section. Please suggest or guide me if my concern is not correct. I have been working as anew IT support staff for years and I just moved to the UK to have an MBA certificat.I will like to write sap exam , pls advise which one to write. Hope you have the time for my question. hi ..i did find this blog very lucrative and very galvanising.Am a bsc IT graduate and a MBA holder from mumbai university.In 6 months i will be going back to US (chicago)for rest of my future near my dad .I have a basic knowledge about SAP SD.Sir plz guide me as am planning to do a certification in sd from siemens.I have no job experience and being a fresher very nervous about my future.Am a bit oblivious about future steps about sap. plz guide me . 1)Should i go for certification? 2) sap job opportunities for freshers in chicago? I am a Java developer with more than 5 yrs of experience. I want to switch to SAP, but finding it difficult to get any job simply because I do not have any SAP experience. Will getting certified improve my chances of getting a job in this field? I am based in RSA. Thanks for visiting our humble blog about SAP certification ???? How can one get SAP Trainee positions? I am currently working as a Php Developer in a company. I am a fresher as far as Php development is concerned. It would be of great help if you could tell me whether SAP program could help me in any way because I am looking for certification courses which could help me grow. I am working in finance sector in Dammam, KSA i would like to do certification in SAP FICO but there is no coaching for SAP FICO in Dammam so how can i get certified? i am working in paint manufacturing company in internal Audit Function from last 6 years. We are using Sap erp system. In addition to this we have BHP HaNa reporting tool. 1. Whether Sap Fi certification will help me in my carrier? 2. Is there any certification available in Data analytics?? Hi now I am working in a steel company in India.I am interested in doing SAP certification. I don’t have any knowledge about SAP. Everybody say that SAP is having great demand and it will give more weightage to the career.That’s why I want to go for certification. Can you please guide me regarding this. I have a 8 years of experience in procurement and logistics. I looking forward for a career in SAP. what would be your suggestion from where to start and what module to chose. your valued response will be highly appreciated. I think that the best place for you to start in SAP is MM module. MM stands for Material Management and it deals with procurement and inbound logistics. More info is here: SAP MM. I am a Chartered Accountant in India currently working in a KPO in the field of investment banking since past 7 months. I am looking forward for a career in SAP. Should I pursue SAP-FICO certification or rather gain some training/experience related to the same first? I have completed my BSC IT.I want to pursue SAP ABAP. can u plz tell me something about ABAP.and also what kind of package one should expect after completeion of SAP ABAP in india. Can you please guide me regarding this.looking forward to your response. Am from Dubai & I have 4 years of experience in SAP R/3 MM Module. I’ve no such a certificates for SAP. Kindly advice me from where I can get this done. (1)..Will SAP HR make me valuable in the field of human resources? (2)..Do I stand a great chance of employment in the labour market,home and abroad ? (3)What advice can you offer me partaining to SAP based on the fact that I’m just a fresh graduate with no work experience whatsoever ? Looking for advise… I’ve been an SAP FICO consultant since 7 years. Currently Im an inhouse consultant/IT manager for a services company. I do not have any certifications and I’m looking to get 1. I’m unable to decide which is an appropriate one for me… should it be SAP FI? PMP? SAP Associate PM? How much do these approximately cost in India? Dear cleo. All d above conversation is very informative. All our queris are solved but my experience is very different. Iam working with india’s third largest transport corporation in the world as divisional accounts officer since 4 years. Which is d lower management grade.but d drawback is d organisation is totally IT less. All the work is exercised manually. i am looking for much growth both in financial as well as knowledge aspect. Basically i was planning for some of the courses in accounting such as peachtree sage, quickbook etc which r most demanding in MENA countries and switch over d job in the same. What would be ur suggestion on that? Should i go for SAP or some other? I have about 2yrs of IT development experience.I am a SAP ABAP developer and have also worked on SAP BI tools like Webi and Query analyzer.These days i am more into SAP Personas development and may be in near future as per our project requirement i may have to update myself with SAP FIORI too. So what exactly certification should i proceed so as to stay updated! Currently, SAP Education does not offer any certification for SAP Fiori. I guess that the product is still very young and they have not yet prepared any SAP certification for it. You can read more about SAP Fiori in my recent blog post here: SAP Fiori – What Is SAP Fiori and How You Should Prepare For It? hi everyone,i have one doubt B.E people can do SAP course,Is there any chance to get a job in SAP field…..I did .NET course but now i have to work on SAP.Can yours valuable suggestions. I am a B.Sc ( Physical Science) & Partly qualified in Management accountant, currently working in a apparel manufacturing company for last five years, Our company is in the SAP implementation process from December 2013 & planed to go for GO LIVE on 20th March 2015 , im working as a module champion for CO & involving in MM also. I hv a BE degree and 3 years work exp working in planning and procurement,material management at a big indian manufacturing company. I had to leave my job due to personal reasons but now after 5 years gap i want to restart my career with SAP MM certification. i hv no SAP exp but hv worked on oracle erp system… will i be able to get jobs after SAP MM certification? Happy to write you here… And, appreciations your interest on SAP..
You can very well take up a certification on SAP MM & can work as you desire since you already having good label companies in your profile. Few companies will say like, profiles with the gap 1 plus or 2 plus years are not considerable etc, but at the time of interviews you can tell & win. I am working as a software developer in a company having 1.5 years of experience on Java Technology. Since i don’t have experience in SAP, should i go for the SAP certifictaion? Hi there, I have recently done bachelore degree in Electronics and got no skills in electronics at all. I have a little a bit knowledge about financial statements and stuff like that. I want to know can I go for the SAP certification or are there any pre-requisites for it. Second thing I want to tell you why I started thinking about SAP is that I am an internee in a big company and I know a guy there who is Mechanical Engineer but he’s working there as a SAP employee and getting highly paid. Justify me how can a Mechanical Engineer be a SAP employee ? I`m working in SAP SRM for 4 years. I want to take my certification for SRM . I am from Romania. How I can take my certification? i have 10years work experience in telecoms warehouse and logistics operations but now i want to upgrade myself which SAP program is suitable for me. I do not have SAP idea whatsoever. i did SAP BO training but did not get a job cause they needed exp. i ave done my MBA Marketing and have 10 years of customer service exp. am planing to move back to india so what do you suggest me about SAP as i want to pursue SAP. Nice tutorial. Kindly help me, I’ve 6 years of programming experience in Java as well as Dot Net. Know I want to switch to SAP world. How and from where I can start? and also guide me that which module is better for me? I have over 12 yrs of experience in IT in technology & consulting environment. I have worked with other ERPs for 8+ yrs. I have exposure across all domains, finance being key strength as I am Commerce graduate & Computers post graduate. I started with ICWA but only finished foundation during my graduation. I have worked across multiple roles & areas in IT. I have excellent domain knowledge with good communication skills, and want to build up quick niche career within SAP. Is doing a FICO training & certification the right choice? Is there any other module that is hot in market i could spontaneously take up? What should be the fastest way to get a breakthrough with SAP career? Hi my name is Yogesh Chauhan and I am currently working as an administrator but now I want to change my profession. can I go ahead with SAP certification. And I have a query that I can go ahead with one module of SAP Cifo. will SAP will help me to get a job abroad. I have 3 years exp. in HR as an Executive. I want to move a head & want to do SAP – HR module. Currently I am in INDIA and looking for Job Abroad. (1)..Will I get great chance of employment in abroad ? (2)..Will SAP HR make me valuable in the field of human resources? (3) Advice me good points on SAP HR so that, it will become easy for me to find job? And if not HR module rhen which module will be helpful ? Please cleo I’m looking for answer which will give me way out. Thanks in Advance! Is there any other certification I can do apart from this? i heard u said the courses of SAP are differ, so what is the main purpose of Sap certificate? Thoughts by the author are truly realistic. Mere SAP certification does not guarantee jobs to a fresher. Employers are increasingly looking for real-time project experience as a key criteria even for entry level positions. It is hence wise to find a platform where you can not only learn but also get industry experience. i have done b.com and working for IBM for 2 yrs. Now i am interested to join SAP training. Please suggest. I just started working in SAP-BW. Is it useful me if I do SAP-BW certification. Is there any scope for it? Hi, I am sales and marketing professional. I want to switch in IT field how SAP certification help me in that or would it possible after getting SAP certification I can get good job. I am 26 year old graduate in accounting and finance. I belongs to Pakistan and have 4 years accounting experience. Currently I am pursing for ACCA with my job in Abu Dhabi UAE. I want to advance my career in SAP. I have to start it from scratch. Can you please guide me. Or suggest me any blog or person to start this journey. Which module I have to take, how and from where I have to start. I read your whole article. Plz answer me some thing that I’m mba in IT trade and still didn’t do any job but now I want to do certification in SAP ABAP. So is it good for me or not and is it good for future?? Because I have no idea about it. Will I get a good job after SAP certification? Ofcourse you will… Get Certified & All the very best.. I have done MBA HR. I have 4 years of experience into Recruitment.currently working with Recruitment Consulatancy. I am planning to go for SAP certification.wil it help me out to get better job in HR with Sap.i dont have any idea anout Sap.n hoe it help me out for better opportuniteis.what r the options r there in SAP to make my profile strong? I’m a first semester Computer Science student. i wanted to ask , Should i do SAP ? and which module ? Kindly answer my question ASAP. SAP has technical & functional modules, if you are good in coding,programming etc, you can adopt for SAP module like ABAP [Technical],which even college fresh graduates can go for it. There are certain university, which secured SAP License & providing SAP courses to their students. I have been working with one of the companies here in Japan as SAP Administration support. I will be taking up System Administration [Oracle DB] with SAP netweaver 731. I am quite hesitant because i know my knowledge and experience is not enough. been working for 9 months and my exam is on september 2016. Please give me advices and recommendations. Also, I dont have enough budget to enroll in SAP standard education. I will appreciate any ideas. thanks! SAP has technical & functional modules, if you good in coding,programming etc, you can adopt for SAP module like ABAP [Technical],which even college fresh graduates can go for it. But for functional modules like PP, FI,MM & SD etc, profile needs some domain exp. Kindly ask me the things which you required to get more clarity regarding Certification. In India means.. Certifications can be done either by registering in SAP Authorized Academic Partners/Institutions like ATOS, Tespa, Broadline etc Or by SAP Business Partners where, an Organization can provide an offer to its employees. In your case, you got to approach SAP Authorized Institutes i guess..
SAP has Technical & functional modules, based on your interest you can choose after a best counselling. Im a Bcom Graduate. Now im looking forward for SAP FICO Would you pls help me with this doubts. 1. Where should i start ? 2. What is this SAP Experience. 3 . How to get proffessional level certification? Well, If you wish to get certified, just walk-in into any authorized SAP Partner like Atos, Broadline & Tespa etc. And, Certification –> 1. Associate Level- this one you will & Professional Level, it need more project exp. Plz guide me my qualification is mba finance and masters in economics..i am planning for doing sap fi..from any institute in bangalore india..will dat b good..dey r promising of giving very good knowledge and the course duration will be 1.5 months..and fees would be around 150000 inr.will dat be beneficial? I did MBA in SCM. please guide how & what certification will help me in my progress. Obviously, its SAP MM then you can go for SCM, SRM etc. I’m looking for extended career in SAP. Currently I’m working as SAP SRM consultant with a bit of ABAP technical skills. Now I’m planning for master degree in the field of SAP. what would be helpful for me? Certification is enough to get a good job across the globe? A Bachelor degree is usually sufficient for a career of an SAP consultant. You can also go for SAP certification if you want. I have done MBA in HR and 5 years experience in the same field. Now I have 2 years job gap due to marriage. So please help me that I should join SAP in HCM for my career growth or what to do next. Well you have gained some practical exposure in an un-authorized SAP Institute. if you are keen to make SAP AG Certification, it should be done through SAP Authorized Partners, in India it costs around Rs.2.6 Lakhs for Online & nearly Rs.4 Lackhs for regular class room training. If you want attend a SAP training along certification make sure do it from an authorized training center. But my first advice will be don’t leave your current job as sap openings for fresher’s is very less presently. No institutions will provide you placements instead they will suggest you to attend an interview if there is any openings in an company. Well.. All the best to get your desired job. And, having a knowledge in SAP FI additional to your domain, surely will add valve but nowadays most of MNC’s or Implementing firms expecting SAP Certified Professionals. And, MNC’s SAP Freshers drives & recruitments also will be done with SAP Authorized Partners. So if you are fixed to start up your career as SAP Developer, go ahead with Confidence. I am SAP BASIS consultant with 3 years experience, interested in certification. can any one help me to get good knowledge for the course and its scope to start with. I am a BE and MBA marketing graduate with 6months of sales experience. For better career and job I want to know these things. 2. What is the best suited module to my profile ? 3.What will be the best time to exit from my current job & pursue SAP Course and which course should be best in the market ? Nice to know about your interest in SAP. Keeping it short, Opportunities are there in SAP SD/CRM but for a fresher it is ver few. People who have completed certification get jobs after 6 months to 2 years. He has not done any degree but wants to start a career in SAP. He has no SAP-related experience. Is it best for him to do SAP CERTIFICATION? We are located in Middle-East. If its a good idea to start off a career with SAP certification, what would be the best modules to begin with in his situation? can I get the list of SAP modules, i have been finding it but unable to get it. its a wonderful platform for geeting quieries cleared. i wanted to ask that i m a b.com. gtaduate and now i want to do FICO. will it help ke to get a job.?? what are the advantages of FICO course.?? plz reply i m in big delima.. I can understand the fact, but I have in seen in many web pages advicing us to be experienced before opting for SAP certification so its my humble request please tell me the whole procedure like how I can be experienced before SAP certification? In Technical modules like ABAP, Basis etc, even college graduates can go ahead, its all about coding, programming etc. If you like to learn the basic knowledge , join in an best un-authorized institutes & learn the basics then go for certification. OK thanks for your help but I have one more question like I want to SAP BASIS as you told me I need to gain the basic knowledge in an authorized institutes but after that before professional certification I.e global certification do I need to do the SAP BASIS training in authorized institute? After i am done with the basic knowledge Which will be better like to pursue SAP in self learning and gaining experience by doing a job or to do a regular course in the SAP institute? Hii My name is Mohamad Imad from India.I am B.com graduate. which course is suitable for me. Hi My Name is Chinmaya. From Last 5 Years i am working in SAP FICO Module.I am SAP certified CO Consultant.Want to appear S4 Hana Finance Certification only Paying the examination Fees. I will be obliged to you for this.Presently i am working with NTT DATA,Gurgaon,India. Waiting for your reply. Cleo Isco. Hi sir …I got selected in steel manufacturing company for SAP in pp module..I’m from BE CS background..can my experience Wil help me to get job at IT company for SAP job like SAP labs ..etc.I’m fresher I don’t know anything on SAP.. Please post your question at our forum. It is not directly related to this post, so it is not appropriate to ask it here. I am doing my MBA in Operations Management. I had a prior experience of 2 years in IT services. I like to know if there is any SAP course suitable for my career related to Operation Management. Expecting a wide view from you. As I wrote above, please post your question at our FORUM and I will answer it there. It is not directly related to this post, so it is not appropriate to ask it here. I am a B. COM (Hons) graduate and 36 years old. I am working as Equity and Derivative Dealer since last 10 years. Now I am willing to change my field for better career growth in Accounting. Pls suggest me a course in SAP and its future prospect in Kolkata, India. I will be highly obliged if you reply in my email. If advantageous than which module? I was going through your blog, it was really helpful. But still i have some doubts, am graduate in B.E. CSE after that i pursed MBA in business analytics now i have one year of experience of education industry. In next 2 years i’ll shift to USA now please guide me i thinking for SAP certification. would it help me in USA for jobs and if yes please suggest in which module i’ll go. I’ll be grateful if you reply asap. thanks! Sir l am doing ACCA, plz suggest me which module of SAP & how much it will cost.. I am Masters student in Supply chain management. I have no work experience with SAP. I want to learn and develop the functional aspects of SAP in the supply chain. How should I go about pursuing the certification. I have two Certification that I like SAP SCM and SAP APO. Which one is better for me? And how should be the hierarchy of certificate in SAP? As the companies that I was looking for internship needs a fair bit of SAP knowledge. Can anyone please suggest me in this matter? I have read all your comments and suggestions.I am SAP ABAP consultant and have 2 years of experience.I am planning to do certification either in ABAP or HANA.Could you please help me in this regard which is better for bright future( ABAP certification or HANA certification). I completed my B-TECH in Mechanical Engineering and i also have basic software knowledge,now i am interested to join SAP ABAP….is it use full for me in gaining a job? Hello, I am Poonam, I have done MBA in Finance and HR in 2012. Now, I am looking for SAP Certification courses because i did’nt any job in Finance and HR field. I am working in Front office and administration related job in small companies. Please suggest me should i go for the certification and how do i get job in relevent specialization after certification? I am Tamilselvan completed my BE mechanical engineering and working in gulf for past 4.5 years and have overall experience of 12 years in oil and gas field as an END USER in SAP MM & PM module. Still I would like to do certification in the above said module. Query : Is there any Authorized Certification course available for the END USER level. (Location preferred Chennai and Bangalore).If so, can any one share information regarding this? I am gopal,currently working in bank.Shall I do Sap?? This suits for me ? Let me know the career options in sap? what opportunities in India or in Asia, with SAP certificte? My name is Ashley and I would like to learn and possibly get certified in SAP. However, I’m not sure which area. I would like to begin with the basics. I have my MBA in business management but, I’ve always worked in the oil and gas industry using my mechanical engineering technology degree. Recently laid off; I would like start using my MBA degree. Where should I start with the SAP program? There are several job opportunities here in Texas and I would like to get training. Any suggestions? Thank you all for your answers and explanations. My question is ; I am in the USA with long great experience in VSAT systems and networks. Handled many projects at management and technical level. But do not have any SAP previous experience ever. I never worked on it. What is the best start for me in the certification path. hi,i have SAP knowledge,but i would like to have SAP Certification.What is the best way to get the certificate ? Next Next post: We Are Giving Away Money!